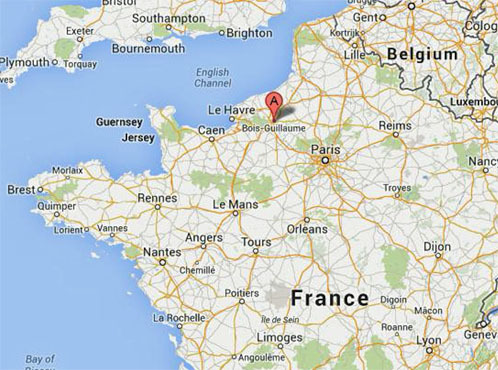 Janice follows the trail of Joan of Arc, ending in Rouen, France. My journey to Rouen began with the #2 metro, transferring to the #12 to Gare Lazare, the Paris station serving Normandy. It is so easy to use the Paris metro! The train left right on time and I easily found my hotel in Rouen. Befitting the drama of this pilgrimage, it had been bright and sunny in Domremy where Joan was born. Here in Rouen the day began rainy and chill. I made my way to the town square and just spent time exploring the area. Rouen was heavily damaged by Allied bombing during World War II and I knew that most of the buildings I was seeing were reconstructions. Yet they did recreate their medieval half-timber character. In fact the entire city for all its restoration felt more authentically medieval that some of the other towns I had visited. The square is much larger than it was in medieval times. The foundations of the former buildings can still be seen in the pavement. Around the edge are restaurants, pubs, souvenir shops, and stores. 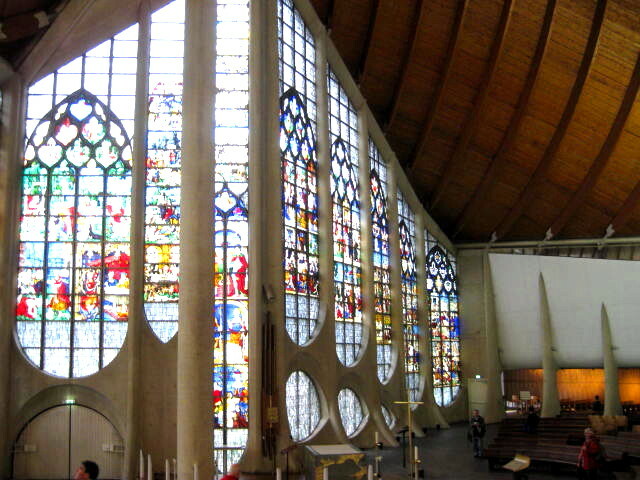 In the center is a beautiful very modern church completed in 1979. Adjacent to it and repeating its lines is the old town market with fresh fish, fruits, vegetables and meats. It reminded me so much of Pike Place Market in Seattle – except that nobody was throwing fish and there is no Starbucks across the street. I lingered in the square waiting for the church to open. I found the plaque on the very spot where Joan was burned. Beside it is a giant cross soaring up into the sky. 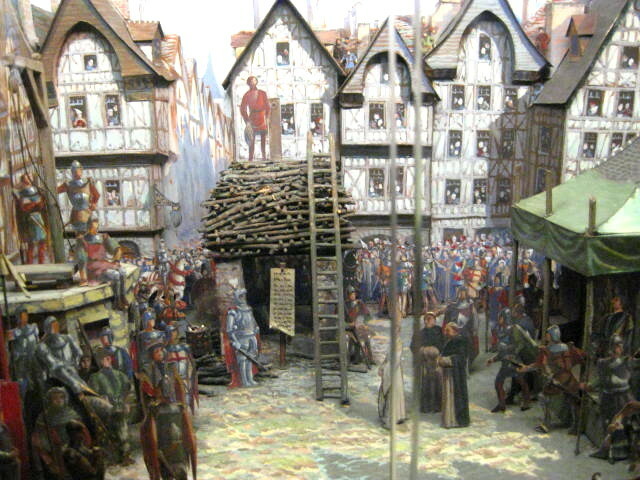 As part of Joan’s exoneration in 1456, the town of Rouen erected a cross on the site of her martyrdom, but that one was long since destroyed. This gleaming metal cross was erected at the same time as the church. Finally the doors of the church opened and I went in and sat down. For two weeks I have been following Joan from Domremy to Chinon, Tours, Orleans, Reims, and Paris. For months I have been planning this trip, booking hotels, investigating train schedules, and examining maps of each city. For many years I have been studying the phenomenon of Joan of Arc. Now finally here in this place I could no longer hold back my emotions. The planning, effort and expectations for this pilgrimage were now finally complete. I sat there and sobbed for many minutes. Once he gained his crown at Reims on July 17, 1429 – just 71 days after Joan raised the siege of Orleans – Charles VII, now duly anointed King of France, seemed to lose interest in the war and in her. He dithered in northern France and unenthusiastically permitted Joan to attempt to capture Paris. After one day of failure, September 8, 1429, he withdrew back to the Loire, abandoning all the cities that had opened their gates to him two months before. Those cities suffered heavily under the English and Burgundians who returned to retake them. When the city of Compiegne cried out to Charles to come to their aid, he ignored them. Joan, however, did not ignore them. She left the French court without permission and headed north. Along the way soldiers joined her for the opportunity to fight alongside The Maid. On March 29 she defeated a Burgundian force at Lagny and by May 14 she was in Compiegne. She tried to come to the aid of several other cities nearby but their governors, disgusted at Charles, sold out to the Burgundians. When Joan returned to Compiegne on May 29, she found it surrounded by a large Burgundian army and she had to sneak in at night. Defense was not Joan’s style. The next day she led a sortie out of the city and by her own account forced the Burgundians back three times. Seeing that they could do no more, Joan and her soldiers retreated back toward the city when they were overwhelmed by the enemy. Joan was a prisoner of war. Duke Phillip of Burgundy was delighted with his prize. He paraded her through his lands to his castle of Beaurevoir. He kept her there for seven months while negotiating her sale to the English. Bishop Couchon of Beauvais drove the negotiations until December when the English agreed to pay the enormous sum of 10,000 gold pieces. Joan was taken to Rouen for trial. 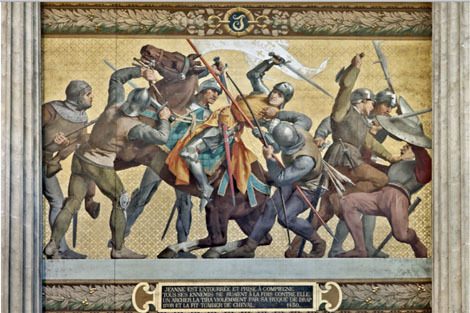 The trial of Joan of Arc was a very high stakes matter. The Catholic Church could not tolerate having people talk directly to God. That would put the church out of business (a point driven home by Luther 86 years later). The English could not tolerate The Maid fighting them on orders from God, because that would call into question whose orders they were following. The trial, therefore, had to paint Joan as a heretic and Bishop Couchon led the attack. 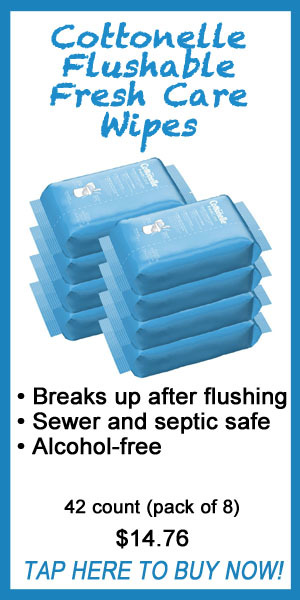 The proceedings dragged on for five months. 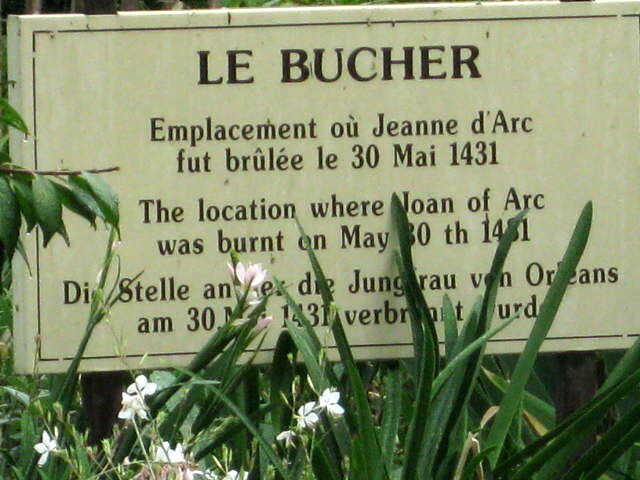 On May 30, 1431, Joan of Arc was burned alive in the market square of Rouen. A small diorama in the historical museum depicts the scene. I needed lunch and across the square I found a deli operated by a kindly elder woman who was third generation at that store. The wine, quiche, and cheeses restored me to continue my exploration of Rouen. I found the Tower of Joan where she was imprisoned. In 1431 it was part of a fortress that housed the English garrison but now only this tower remains. Both the condemnation and the exoneration trials were held in the bishop’s palace adjacent to the cathedral. 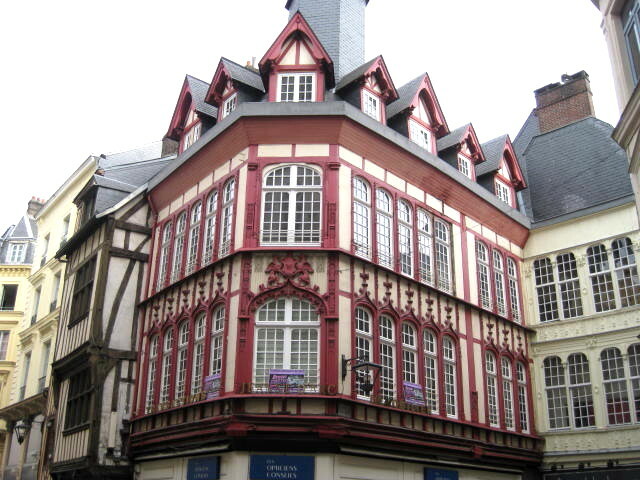 The place has been converted into a multi-media interactive historical museum focused on Joan of Arc. 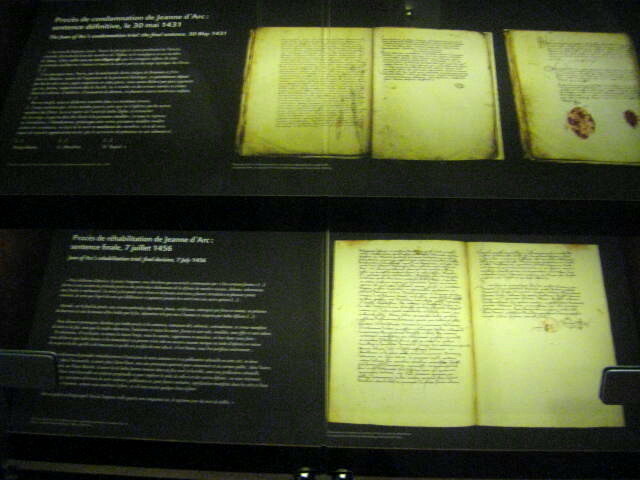 The videos feature actors playing the roles of the Archbishop of Reims, Jean Juvenal des Ursins, who conducted the exoneration trial, and witnesses – including the doctors of the church who condemned Joan. The questions and answers and compelling performances made history come alive. Here we were in some of the very rooms where these actions took place. The reenactment is powerfully compelling. Copies of actual documents in the archive rooms. Just as impactful, especially for me as a historian, were the archive rooms. These contained copies of the actual documents – Joan’s sentence to death and her ultimate rehabilitation. It also contains posters and documents of how Joan has been used to promote patriotism during world wars I and II and how various factions of French politics have adopted her for their causes. There are artifacts and displays that bring the story of The Maid to life in an almost tangible way. This historical museum is so well done that I went through the whole thing again the next day. 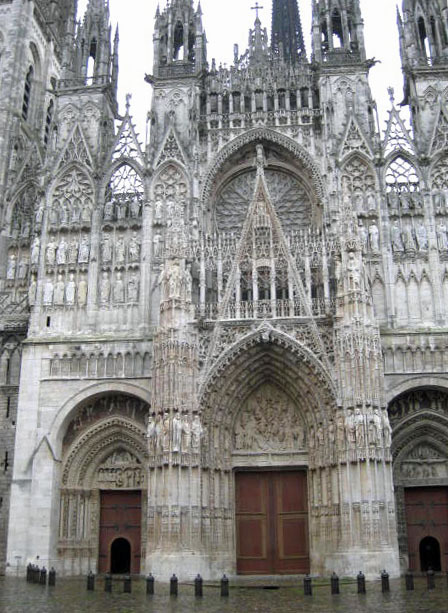 Rouen has many sights to see. The cathedral is a delicate dance of stonework reflecting the finest skills of the mason’s art. The bridge from which the soldiers threw Joan’s ashes into the Seine has been rebuilt with a statue on its balustrade recalling the Norse character of this Norman capital. 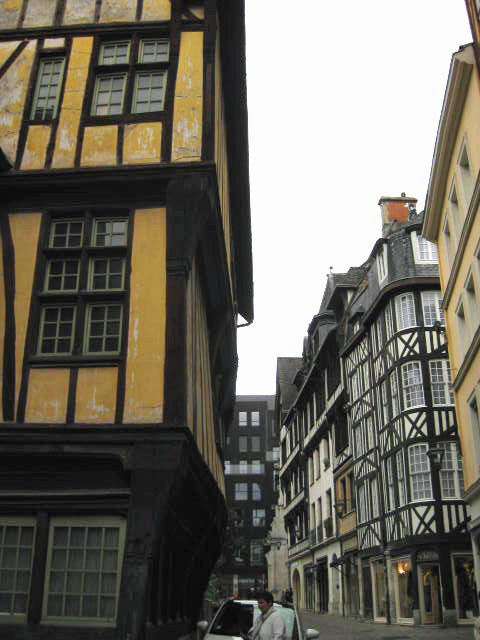 The buildings of the old town themselves are a delight for the eyes with their half-timbered walls and leaded windows. Best of all in my opinion is the food. Around the corner from my hotel was a coffee shop with hearty brew and donuts with sprinkles. Unfortunately it didn’t open until afternoon, so I had to settle for a shop window donut and caffeine. Across the street from the historical museum was a wonderful restaurant which was so good I went there twice. The salmon salad with olives and gentle easy-over egg on top was 5 star! Here in Normandy, besides brie they also make calvados – an apple brandy. Delicious. The two ends of my pilgrimage to Joan of Arc – Domremy and Rouen – were not only the most moving in displaying her story but also the most pleasant and satisfying places I visited in France. I may return but nothing will equal the impact of my first encounters there. 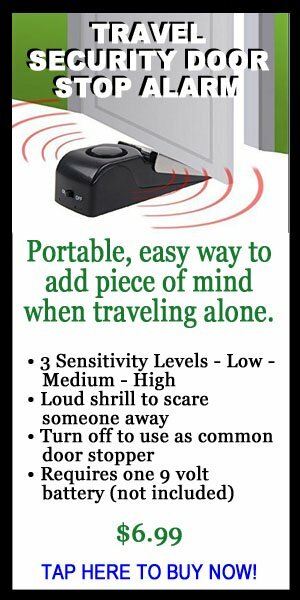 Janice Van Cleve is a writer who has traveled the world and who may someday publish a book of her adventures. She is also an archeologist, and guest lecturer on tours who has published several books on the Maya.